Triathletes rock out with a ton of gear in training and on race day. Here’s a breakdown of our favorite bags for triathletes. Triathletes have no shortage of gear when it comes to training and competition. Getting kitted out for the swim, bike and even the run portions of practices and races requires a sizable amount of equipment. From the high-tech end of stuff, including your favorite triathlon watch, to your favorite pair of goggles for open water swimming, there is no shortage of kit to lug around with you. 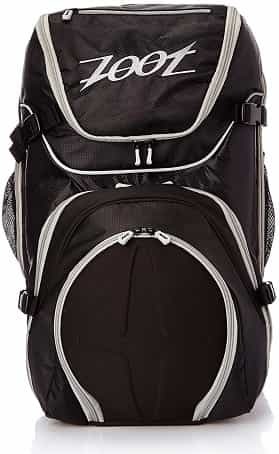 You work hard on the road and in the pool, and you want a triathlon bag that is going to stand up to the daily use, travel, and general wear and tear of being a three-sport athlete. While using a swim bag can work in a pinch, they generally don’t have the same volume, compartmentalization, and added pockets that tri bags have. 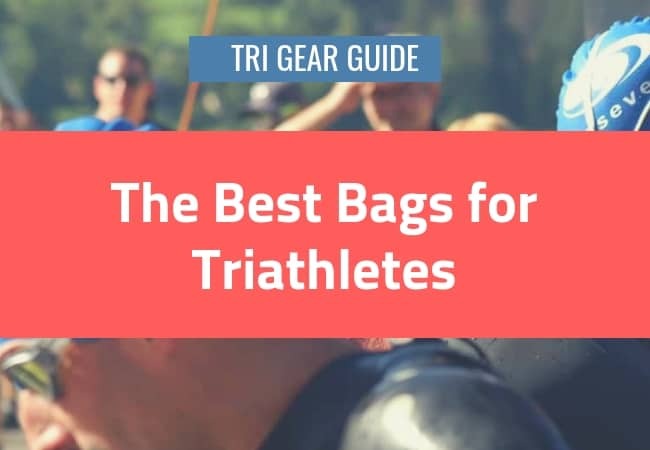 Here’s our breakdown of the best bags for triathletes. Speedo is better known for producing gear for competitive and recreational swimmers. They are also no stranger to bags for aquatic athletes, with the Speedo Teamster bag ranking as our most popular backpack for swimmers. Speedo also produces some great gear for triathletes (the Speedo MDR 2.4 open water goggles are a personal fav), and this includes the Speedo Tri Clops Tri bag. 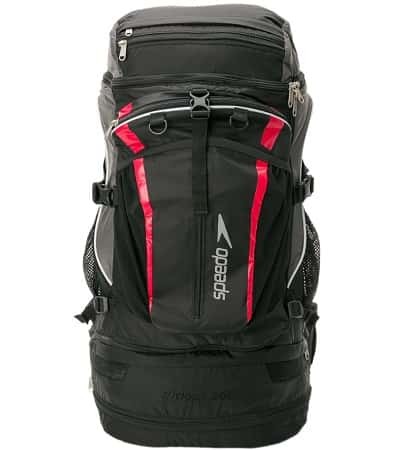 As the name suggests, the bag is a tri-headed pack with dedicated storage for both your running and cycling footwear, side mesh storage for keys/smartphone/etc. Mount your helmet to the front of the bag, while also being able to access the top of the bag. The waist strap is basically a fanny pack, and the back of the bag is ventilated to keep you cool in hot conditions. The bag is large—50L of volume–with plenty of room for all your practice and race day gear, and along with its low price is why it ranks as our best bag for triathletes. 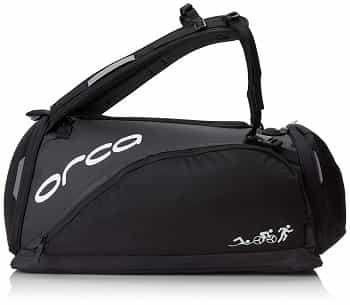 Versatile, huge, and designed for all of your racing and training day needs, the Orca Transition bag is right up there at the top for us in terms of functionality, looks, and sturdiness. In fact, it was voted Triathlete Magazine’s best in class for best transition bag in 2017. The big draws on this bag are size and versatility. At 70L in volume it can store everything you can throw at it. The feature that sets apart from the other bags on this list is that you can wear it as a backpack on race day, and then swing around to the side and tote it around as a duffel bag. Pretty neat. The Orca Transition Bag includes most of the goodies that you would expect, including the waterproof compartment at the bottom (helpful location so that your sopping tri and swimming wetsuit or neoprene buoyant swimming shorts don’t water-log your dry gear), a felt-lined pocket to store your valuables, and a Seattle Seahawks-lime green interior so that you can quickly see what you are working with. 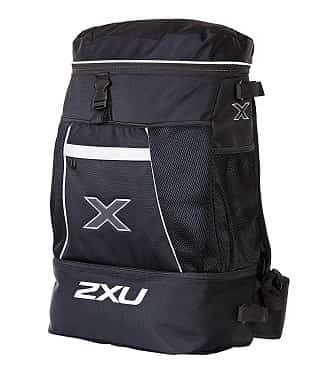 Boasting a huge center compartment to store all of your race-day apparel and gear, the 2XU Transition bag (2XU is perhaps better known for making awesome compression gear) has all the goodies you would expect for a triathlon bag. Padded shoulder straps for easy and comfortable wear, a waterproof compartment for your wet stuff, reflective stitching and lettering for visibility in the dark, and a ton of zippered and mesh pockets for storage. Zoot Sports Ultra Tri bag features two side pockets for water bottles/shaker cups. Triathletes spend a lot of time in the water getting wet, so a removable and sealed compartment for your soaked training suit/wet-suit is handy. With reflective detailing to help you stay visible, a fleece-lined top pocket for your valuables, and is sized appropriately to be used as carry-on luggage the next time you fly for a training trip or race. The biggest bag on our little list—at nearly two and a half feet tall—the TYR Elite Convoy Triathlon bag is a little bulky, and not particularly recommended for shorter athletes. 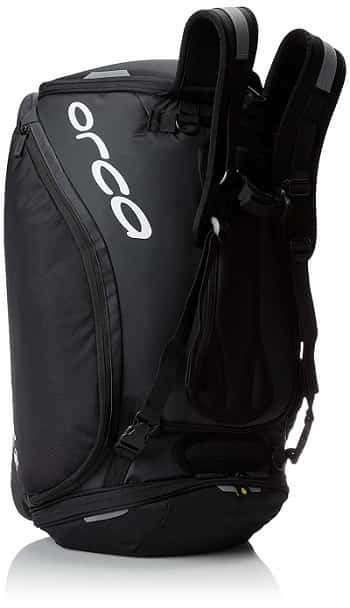 The bag is framed with metal poles on the inside of the bag to keep it standing, includes a “wet” compartment that is sealed off from the rest of the bag, with two other compartments to load your cycling and running gear. Like most triathlon bags, it has exterior mesh pockets for water bottles and easy access. In total, the TYR Elite Convoy bag’s volume is a staggering 70-litres (the Speedo tri bag has “only” 50L in storage capacity). 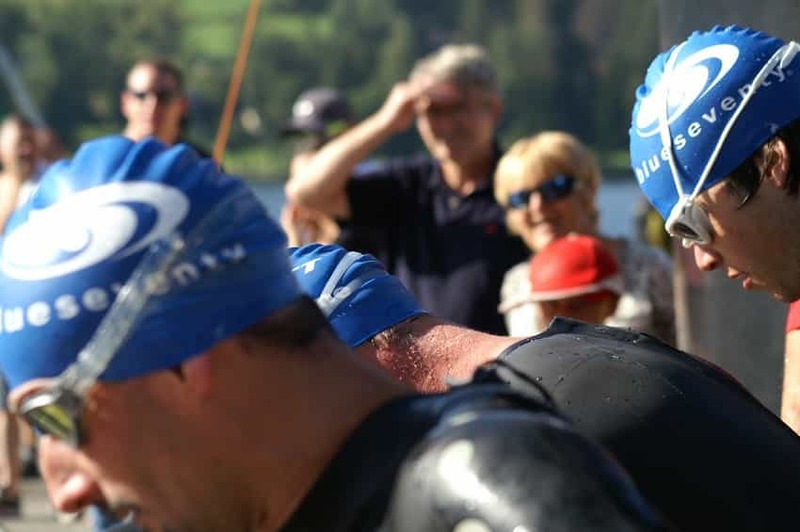 Blueseventy is no stranger to triathletes and open water swimmers. Their neoprene swim cap and swimming gloves for cold, open water swimming are list-toppers. 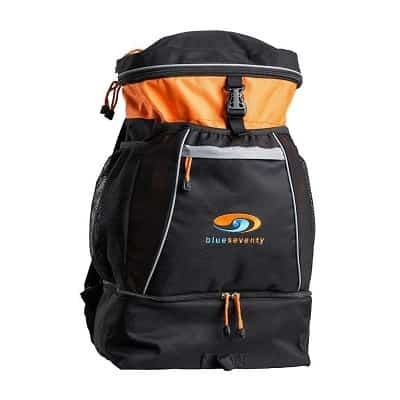 The blueseventy Triathlon Bag is a respectable addition to their inventory of gear. Features of this bag include: a compartmentalized and extra-thick bottom section for your sopping swim gear that is 12L large, a big, fleece-lined pocket on top of the bag for the important thingies (phone/keys, etc), and an elastic compartment on the front for your bike helmet. One stand-out feature is a padded interior sleeve that can be used to store a tablet or smaller laptop. 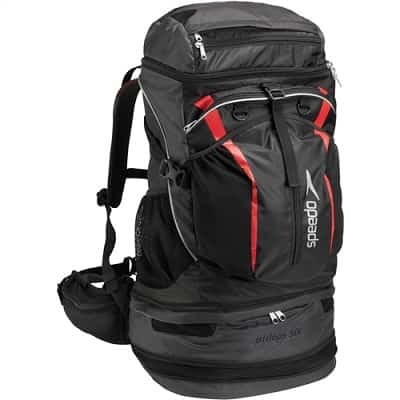 Total volume of the bag is 44L, making it the smallest of our reviewed bags. The blueseventy tri and transition bag is on the lower end of the spectrum in terms of price, costing about half as much as the Zoot and TYR Elite bags (and around the same as the Speedo bag).